A wise person (my mom) once told me that an effective way to make up your mind about something is to make a list of pros and cons, review it, and then make your decision based on which column has the most convincing things in it. I've applied that to many important decisions in my life, such as where to live after college and whether or not to buy a trampoline. Today I've decided to give it a shot with this restaurant review of Glasserie, so that you can effectively decide whether or not to spend your money there. - Awesome atmosphere. 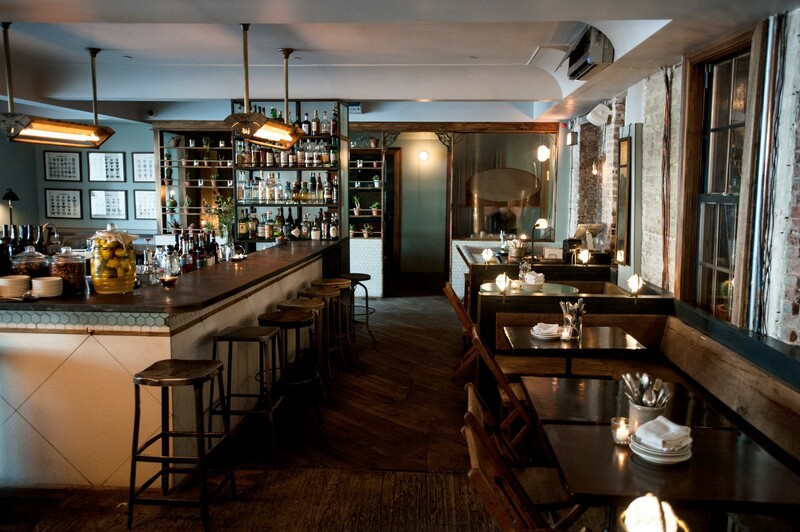 Maybe the best restaurant vibes in Brooklyn. - Interesting food, influenced heavily by the chef's Israeli heritage. - Lots of excellent vegetarian options on the menu. - Square bar, ideal for scoping other patrons across the bar. - One of the best things on the menu is bread. Cons: - One of the best things on the menu is bread. - Staff is too cool to have emotions. - Portions are on the small side, especially if you are sharing. - Lots of hype. Might be responsible for the term "New Greenpoint." - Other patrons might be scoping you from the bar. - Isolated location, unless you live in an abandoned warehouse nearby. The way we see it, those pros outweigh the cons, though there are certainly some significant cons Ultimately, we like Glasserie. But we might like it for the ambiance more than anything else. If you do decide to go, bring a bunch of friends, and try a few things to share. And let us know if you need help with any of the other big decisions in your life, like whether or not to buy a trampoline. That is a trick question. Whatever you're eating at Glasserie, you want to be eating with bread. There are two kinds available to you - flatbread and flaky. Both are delicious, but the flaky bread is really where it's at. It's dense and buttery and slightly charred, and goes amazingly well with a side of labne. You're going to end up eating a lot of this. Our favorite thing from the top half of the menu, without question. Caper yogurt belongs on everything. Very Middle-Eastern, and very good. In case these are new to you, they are sort of like the Spanish croquettes you've probably had at one point or another, but meatier and full of spices. I love them, thanks to my Lebanese heritage and familiarity with the dish. If you don't have any of that, you may not. We're avoiding brussels sprouts these days because we are very, very tired of them. But we finally gave these a shot on our second visit to Glasserie, thanks to two different servers' persistence. The preparation was nice -tossed with apple, chevre, and pine nuts - but they're still kind of just brussels sprouts. An excellent lamb tartare with chopped olives. We also love the bulghur crackers that come with it, because they bring a nice grainy texture to the equation. Just know that you shouldn't expect this to taste like your average steak tartare. Lamb is a different ball game. Like cricket. Soft, sweet-potatoey dumplings that should be on your table. Hen of the woods mushrooms and cranberries came with them on both of our visits. This sounds more interesting than it tastes. The chicken is nice and all, but it's just not an exciting dish. Roman’s is not as good as you want it to be. That’s the only way to put it.